Has the action star and WWE Legend revealed which DC Comics superhero he'll bring to the big screen? Dwayne "The Rock" Johnson has taken an unusual path through action stardom of recent, in spite of his obvious box-office power. Apart from G.I. Joe: Retaliation, he's avoided grabbing up the licensed characters and superheroes that dominate the schedules of other Hollywood tough guys, instead taking up original characters often in supporting roles in existing franchises. But that may be about to change. In a video interview with TotalFilm, Johnson plays it coy (but honest) about his long-running and (apparently) complex dealings with Warner Bros over which DC Comics hero he might play; but does tease the impending announcement of a character who has "the power of Superman" and "can throw down" before ending on a grin with "say the word" - which to many fans should feel like an all-but-certain signal that he's talking about the original Captain Marvel, aka Shazam. Originally created in 1939 by C.C. Beck and Bill Parker for Fawcett Comics, Captain Marvel began as a Superman-like figure differentiated by his unique origin story and secret identity. 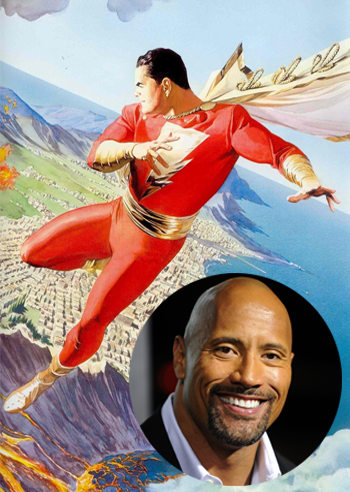 The "Captain" was actually a 12 year-old orphan named Billy Batson who, following an encounter with an ancient wizard, was granted the ability to transform (physically) into an adult-sized superhero by calling out the wizard's name, "SHAZAM!," an acronym for Solomon, Hercules, Achilles, Zeus, Atlas and Mercury - ancient heroes whose powers and abilities he is imbued with. In his day, Captain Marvel was the most popular comic-book superhero in the world - even more so than Superman - but ceased to be published in 1954 because of copyright infringement lawsuits from DC Comics and the general lack of interest in superheroes in the decade. With the character no longer in use, Marvel Comics created an unrelated Captain Marvel of their own, leading to an long-running situation whereby DC Comics (which acquired the defunct Fawcett in the interim) can publish stories featuring the original but cannot use his name in any advertising, covers or promotional material. To help manage this, Billy Batson has referred to his superhero-form as, simply, Shazam as of the 2011 "New 52" DC Universe reboot. Editor's note: The announcement will come this week during Comic-Con, and The Escapist will have a full compliment on the scene in San Diego. Be sure and keep your eyes locked to our Comics and Cosplay and Movies and TV channels for all the news from the convention as soon as it breaks.